The key to a successful blog is getting visitors. The more traffic you generate to the site, the more awareness you create about your brand, and ultimately the more money you stand to make. The hard part for many bloggers is finding the right traffic and getting them to come back on a continual basis. Though there are many ways to generate traffic to your blog, one method that has been proven to work wonders is email marketing. When you have a list of emails, you have a lot of power in your hands as a blogger. They are a great way to generate traffic to your site. The trick however, is to develop a large enough list of emails to get customers to come back. There are several avenues for generating an email list including having members subscribe to your blog, sign up for updates or newsletters and more. 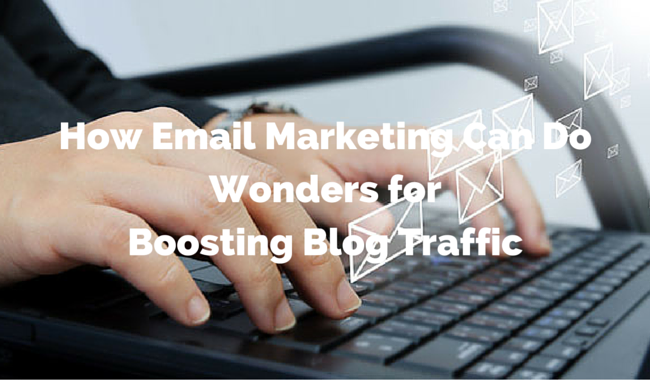 The more emails you’re generating, the better it is for your blog. So, what do you do with this email list? Well, once you have a list of viable emails you can begin sending out marketing materials that will entice them to check out the newest posts to your blogs. The great things about using emails are that since the list was compiled from subscriptions and signups, the customers are actually interested in what you have to say. That way, as you’re sharing updates about your site, the traffic will be authentic and thus improves the chances of them coming back to your site over and over. Now that you know exactly how valuable email lists can be, you need to learn how to generate authentic emails without hassling your target audience. Here are some ideas that have been tried by other bloggers and marketing professionals. One of the simplest ways to increase your email list is to create sign up forms. They can be placed on your company website and blog for easy access and completion. Of course you want to add call to action words that sound enticing like, “sign up for future updates on the blog” or “sign up to receive tips, tricks, and discounts on the daily basis”. Social media is a major platform for gathering email lists. You'll find that one Magento development company’s tips include creating a social media campaign that advertises free materials in exchange for an email address to download. If you’re a blogger with a wealth of information, you can try something as simple as, “sign up to receive a free e-book on making money as a blogger”. If your audience is interested in earning cash, they’re most certainly going to sign up to receive a free ebook on how to make money. There are some traditional methods for collecting emails that can work to your advantage. If you’re a brick-and-mortar location, for instance, you could have sign up forms that require an email to receive the latest discounts and coupons. If you frequently attend networking events, having small forms for potential clients to fill out contact information would be an easy way to get their emails. Some might think that email campaigns are a thing of the past. However, the truth is, many people access their email accounts on a daily basis. If you’re looking to generate quality traffic to your blog, you’ll need to first develop a plan to increase your list of emails and then send out compelling content that keeps them wanting more. Hopefully these tips have given you some idea of where to start so that you can boost traffic and ultimately increase your earnings. Yes You are Right Chandeep. But I think Email Subject is also very Important because if no one open your email then it is not possible to drive traffic from E-maillist as well as Sells. It is very long time you don't publish Blogger Template. Requesting BTNT V2.0 ( YOU USE IN YOUR BLOG) .Its awesome template with responsive design and a little bit improving loading speed. Nice elaboration. I liked it.